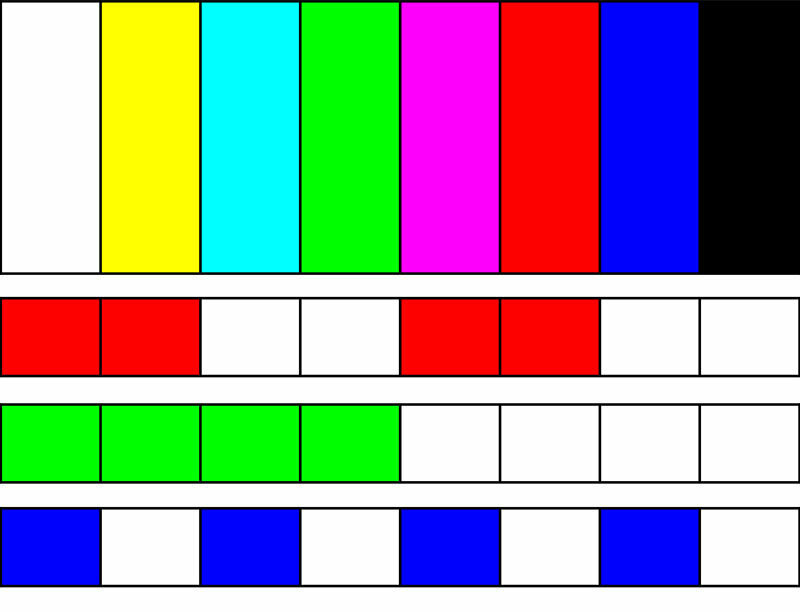 In the development of television, "color wars" are analogous to the adoption of VHS over BetaMax and Blu-ray over HD-DVD technologies. Murray's study shows how the adoption of standards in media technology directly impact audiences to this day. Considering that television became commonplace in US households after WWII, it's difficult to imagine that the first public demonstration of color television occurred way back in 1925. 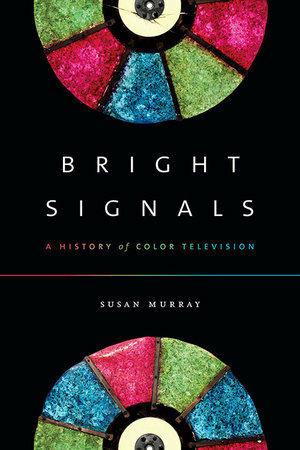 Developing color television, from this side of history, seems like an inevitability, yet in Bright Signals, Susan Murray shows that it was anything but. At the heart of Murray's study is the consideration of color far beyond simply a mechanical or technological event that happened in the consumption of everyday media. Take, for instance, linguistic relativity, which Murray notes is "the idea that people who speak different languages might also think differently" and how that might be applied to perception and expression of color. How subjective is color experientially, and through what language can people discuss their differences of perception, if at all? Whether color exists in objects or only in perception is a centuries-long philosophical debate that Murray integrates into her discussion. Colors also require standards for industrial application, from household paint to railway signal colors to, ultimately in this study, television. Film, and later, television, used color experts to coordinate sets and costume design to ensure the best visual results for audiences. In the early years of the 20th century, the impact of color on mood and on purchasing decisions began to be a significant consideration in marketing to consumers. Murray uses Hazel Adler, author of The New Interior: Modern Decorations for the Modern Home (1923) as an example of a color consultant whose work included selecting colors for the Ford Model A and designing home decorating guides for Sears. She goes on to explain that television, because of the need for standard equipment to ensure a standard quality of viewing, could not be as innovative as other industries in the development of color. Although the FCC is ultimately responsible for setting broadcast standards, entities such as RCA, Zenith, and NBC were deeply engaged in persuading the FCC to adopt standards that would benefit the corporations financially. These "color wars" are analogous to the adoption of VHS over BetaMax and Blu-ray over HD-DVD technologies and Murray's study offers readers lessons in how the adoption of standards in media technology directly impact audiences. The FCC finally adopted the CBS standard for color television in 1950, a decision that was not, unsurprisingly, gladly supported across the industry. The new National Television Standards Committee (NTSC) standards were adopted just three years later and remained the dominant standard until the adoption of digital television technologies. Murray details the ongoing difficulties throughout the '50s as color television was tested and tried. Beyond the technological struggles, critics wondered if the rapid introduction of color was necessary so soon after television itself became commonplace in postwar homes. The cost of a color set was roughly $1k, compared to the average price of a new car at $1.7k. By 1956, she notes, prices for a color television had dropped to around $500, yet only one-percent of the sets in American homes were color by 1959. Cost was also a factor for NBC as the network continued its research and development throughout the '50s, recognizing that color needed to be harmonious and "natural" not only for the network, but especially for its sponsors and viewers. The taken-for-granted nature of color television had a surprisingly long and expansive period of development. Murray explains the importance of getting it right: "Representing color accurately in foods is especially important, not only because the wrong color could turn a viewer's stomach (for example, a greenish steak), but also because processed food itself was becoming more and more colorful during this period." Color experts argued that colors have a variety of emotional impacts on viewers and the correct use of color was therefore important, not only for programming but also, and perhaps more significantly, for advertisers. Murray describes the 1956 event at which NBC and its Chicago station, WNBQ, switched from monochrome to color, in conjunction with the National Association of Radio and Television Broadcasters annual meeting: "Inside the hotel, 'test pattern girls'—models dressed in green, blue, and red, and holding matching color dyed poodles—handed out invitations to an open house at the station for conference attendees. A 'color rally,' mimicking the form of a traditional political rally, was held in front of the Hilton, with decorations, music, handheld rally signs, and local and national celebrities chanting for color." The intent to create a spectacle in order to announce a spectacle is a theme that Murray follows throughout Bright Signals, never passing judgment on the sometimes absurd efforts to make color television a technology viewers felt they must have. During the '50s, consumer interest in color television was also promoted in gendered public spaces: through broadcasts of sporting events at bars and pubs and through special events in department stores and shopping centers to attract the interests of suburban women. Murray provides an extensive history to show how color programming became an increasingly larger part of the networks' offerings, and how those programs were carefully targeted at specific audiences. Moving into the '60s, Murray picks up an earlier philosophical theme regarding the early use of color in the fantastic and the spectacular in television, in contrast with the sense that black and white represented a more documentary, factual nature. An extensive discussion of cultural documentaries -- covering art, nature, and travel in full color -- ensues. These documentaries coincided with a rise of US corporations expanding globally and helped viewers in the United States feel more connected to unfamiliar parts of the world. In addition to the expected National Geographic documentaries and NBC's Wild Kingdom, other programs included Sophia Loren in Rome (1964) and ABC's I, Leonardo da Vinci (1967). Broadcasters were striving to gently educate audiences about culture by using the marvels of color television to highlight spectacular sites around the world. Good research reveals stories that are not widely known, and Murray demonstrates the power of those stories by expanding the scene of the "kitchen debate" between Nixon and Khrushchev to show the earlier part of their argument centered on the supremacy of color television as a means of communication. She ties that historical moment into the larger symbolic role of technology in Cold War discourse. In the US, a good deal of promotional rhetoric touted color television's promise to create a global village and bring the world closer, reinforcing the use of color as an ideological tool. The ubiquity of color television, and color screens, makes it difficult to image the complex social, political, and technological maneuvering that brought these devices into existence and made them commonplace objects. Bright Signals is an important, engaging study that helps readers understand media history and anticipate developments going forward.